Accessing internal services on paranoidpenguin.net using self-signed certificates does no longer work in my preferred browser due to HSTS preloading. Instead of actually fixing the issue (or wait for Let’s Encrypt to roll out wildcard certificates), I decided to be clever and work around the restriction by installing a more “forgiving” web browser. Even though Red Hat Enterprise Linux ships Gnome 3, I could not locate a package for the Epiphany web browser. Instead of going down the Fedora route, I decided it was time get my feet wet with the flatpak format. So what exactly is flatpak? flatpak is a tool for managing applications and the runtimes they use. In the flatpak model, applications can be built and distributed independently from the host system they are used on, and they are isolated from the host system (‘sandboxed’) to some degree, at runtime. Sounds good me thinks. In addition to being dead simple (try issuing flatpak -h) it actually worked as advertised. 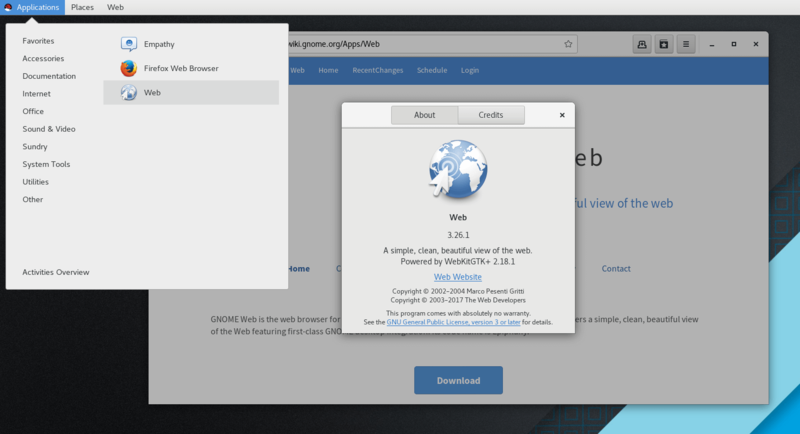 To install Gnome Web (Epiphany), we need to add the remote repositories for Gnome Apps and Gnome to flatpak. The Epiphany browser is available from the Gnome Apps repository and the required dependencies are available from the Gnome repository. Running Gnome Web (Epiphany) on Red Hat 7.4 as a Flatpak application. Should you wish to remove everything and return to a clean slate, then the following commands will take care of business.